Cendi Jean Newberry is voting for Donald Trump. She didn't vote for President Obama because she thought he was a Muslim (he's not). Now she worries Hillary Clinton will take away her ability to own a gun. 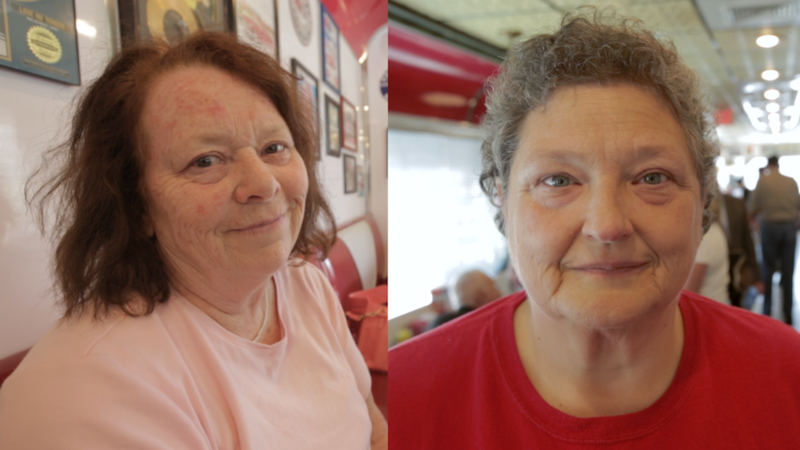 "His background was Muslim," she told CNNMoney over lunch at Diner 23 in Waverly, Ohio, a small town in southern Ohio that is divided almost 50/50 between Republicans and Democrats. When pressed, Newberry admits it could have been information that wasn't true, "but it set in my mind." "Cendi the chef" is arguably the new "Joe the Plumber." In the 2008 election, Joe the Plumber (aka Samuel Joseph Wurzelbacher, also from Ohio) became the face of the struggling middle class. He challenged Obama over what he would do for small businesses and taxes. In 2016, "Cendi the chef" is worried about jobs, guns and morals. It would be easy to dismiss her as misinformed. But her life is a complex tale that gets to the heart of what America's lower middle class is dealing with -- and why she's voting "anti-Hillary" this year. A 66-year-old widow, Newberry earns barely above minimum wage working as a cashier at Goodwill. She trained as a chef but can only get lowly retail jobs these days. The last $200 she had in the bank went to fix her truck so she could get to work. Her mortgage company calls her constantly because she's three months behind on her payments. "I'm living by the skin of my teeth. I collect rain water to wash dishes and bathe," she says. Despite her hardships, she calls herself "blessed." She even believes she has lived the American Dream. She's suspicious of Obama's faith and loyalty to America. But she's extremely thankful to him for bailing her out. Obama's Hardest Hit Fund (known as "Save the Dream" in Ohio) paid about a year's worth of her mortgage after the financial crisis. "If it hadn't been for that, I would have lost my home a long time ago," she said. Newberry describes herself as a "life-long Democrat." But she didn't vote for Obama, and won't vote for Clinton. Trump appeals to her because he's a successful businessman. She hopes he'll bring higher paying jobs. Just $2 or $3 an hour would make a difference for her. How does she know Trump's good at business? "First of all, he had a television show," Newberry said. "People on the show were constantly at each others' throats...and that's what you see in business." 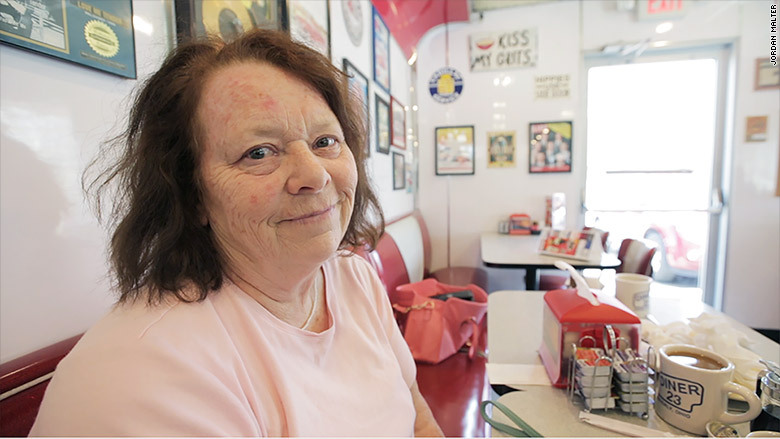 Cendi Jean Newberry of Waverly, Ohio, is 66 and struggling. Newberry and many of her friends are reliant on government payments to get by. In addition to "Save the Dream" funding from a few years ago, Newberry collects monthly Social Security payments for being a widow. She wishes there were more forms of government help for her. But she's abandoning the Democrats. It's a theme CNN has heard over and over again in the Rust Belt: Working class whites blame Washington, but want more government aid. "[Clinton's] going to take our 2nd amendment rights away from us. I need to get some protection," Newberry told CNNMoney last week. "I live almost 13 miles out of town. By the time the sheriff got here, I'd have to take matters into my own hands." If Clinton gets elected, Newberry plans to buy a gun (if she can afford it) before Clinton takes office. A Christian, Newberry credits her faith for helping her persevere. She and her church friend Krista Shockey discussed Trump's vulgar comments about women after the "Access Hollywood" video from 2005 surfaced. They don't think it's right, but they see the Clintons as equally flawed morally. "I just cannot see Hillary running this country, after the email issue," Newberry said. "Let's forget about the sexual habits and ask, who is qualified to run this country?" At this point, Newberry doesn't particularly like her options for president, but she's sticking with Trump. "It's something I feel like I have to pray about," she says.